In this series, I have been trying to familiarize you with the many features of the world's best framework for exploitation, hacking, and pentesting, Metasploit. There are so many features, and techniques for using those features, that few pentesters/hackers are aware of all of them. Many times, when doing a pentest/hack, we need to run a number of Metasploit commands repeatedly. These commands may be exactly the same each time, and just like scripting, we may need to automatically run multiple Metasploit commands in a single step. 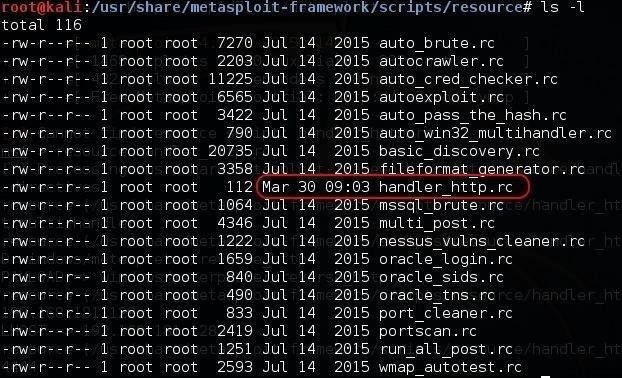 Metasploit has the capability to save and store these "scripts," and they can then be recalled by the script name. Metasploit calls these scripts resource files. For example, in many attacks, we need to set up a multi/handler to connect to when a payload is executed on a target system. In my new Powersploit series, or with the web delivery Metasploit module, we will always need to set a multi/handler to receive the connections from a sent payload. This usually involves several commands: using the multi/handler, setting the port, setting the payload, setting the IP, an so on. To make things easier, we can store all of these commands in a resource file and simply run a single command to execute all of them. 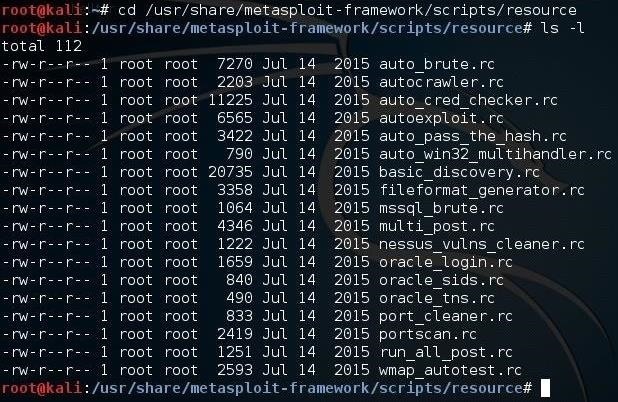 Now that you have a better idea of when these would be useful, let's take a look at Metasploit's scripting capabilities with resource files. First, let's take a look at where Metasploit store its scripts. Let's navigate to /usr/share/metasploit-framework/scripts/resources, and then do a long listing. As you can see, Metasploit has numerous scripts already developed and stored here. Any new script that we write will be stored here as well. Now let's create our own simple script to start a multi/handler necessary to receive connections, such as we used in the first Powersploit tutorial. First, start Metasploit, then enter the commands we want in our script. When we have completed all of the commands we want in the script, we simply use the keyword makerc followed by the name of the script. For instance, here I named the script, handler_http.rc (a multi/handler for HTTP followed by the Metasploit extension for resource files, rc). Metasploit now saves each of those commands into that script file. If we want to see want commands are in a script file, we can use one of the many commands in Linux to display the contents of a file, such as cat, less, and more. Here, I used more followed by the resource file name. Notice that Metasploit now displays the commands in my script file, handler_http.rc. Metasploit will now run each of the commands in our script automatically. Now simply type exploit to start our handler. If we go back to the location where the scripts are stored, we can see that our new script, handler_http.rc, is now stored with the other Metasploit prepackaged scripts. Now, when Metasploit starts, it will automatically execute the handler_http.rc script, and you are ready to go. Keep coming back, my budding hackers, as we explore the tools and techniques of the most important and valuable skill of the 21st century—hacking! I have copied the article about metasploit 21 parts, and I print it by adding credit By occupytheweb, and with the help of google translate .. and i plan to make it ebook (maybe 1 year ahead) ... maybe a little commercial ... how do you think master ...? Can you make a script that takes the ip by itself? Because the ip will be diferent everytime so do you have to create that file everytime? wtf do you mean "different every time"? Install Kali Linux correctly AND DONT USE KALI LIVE and set up networking in your VM or whatever you use correctly, and the IP will stay the same!!! I wanted to know ..if there is a way to get a shell on a remote system if I have whonix running on VB host is windows 7. Then my kali linux is connected to the whonix. Finally, I connect to openvpn. SO, is there a way to get a reverse shell on openvpn using pagekite or ngrok? be it a windows payload or a android. ?